Hybrid cycle lanes would be a major innovation and improvement for both existing cyclists and new people who would be encouraged to start cycling. 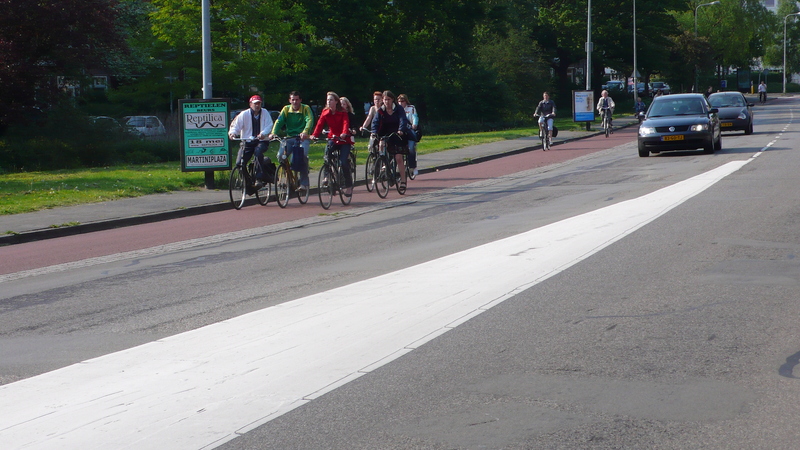 This type of provision is sometimes found in areas of Holland where (like Cambridge) road space is limited. ‘Hybrid cycle lanes’ are an attempt to combine the best aspects of both on-road cycle lanes and off-road cycle tracks, whilst excluding the harmful aspects of both. They are on-road cycle lanes that have some kind of physical demarcation to provide the feeling of protection that less confident cyclists want. Cyclists are in the standard position where they can be seen by drivers. Compare to a typical British-style cycle track such as Barton Road, where cyclists emerge unexpectedly. The space that cyclists need is made clear, and there is room to overtake. Drivers are actively discouraged from using the cycle lane as parking, because of the coloured surfacing and having to drive over a cobbled or textured surface. At side roads, priority is maintained, unlike a Barton Road-style track where cyclists must look in several directions and then give way before crossing. Hybrid cycle lanes are unlikely under present conditions because they could need a full-scale change to the road layout (including moving of services underneath), as well as freed-up roadspace. But the benefits would be considerable. Cambridge Cycling Campaign’s website has more information on hybrid cycle lanes, and there is a feature on them in ‘Cycling 2020′.